Supermac's is a fast food chain seen across Ireland. Their larger restaurants include Papa John's Pizza (which they own the rights to in Ireland), SuperSubs and Mini Macs. Keen to get in on the development of the motorway network, Supermac's privately developed The Barack Obama Plaza, later followed by a sister site, Galway Plaza and two cancelled proposals. In March 2017, Supermac's revealed a third motorway plaza could be opening at Portlaoise. In June 2017, Supermac's began a national advertising campaign which referred to the "Supermac's Plazas", a title which includes the Tipperary Town Plaza and the Mallow Plaza, two additional sites serving the N24 and N20 respectively. Until now each site had been marketed individually. 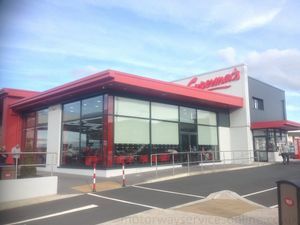 The new campaign described the plazas as "a new era in motorway services", and confirmed Supermac's intention to act like a UK service station operator. In an August 2017 poster, they referred to themselves as "The Plaza Group", with an accompanying logo.